Le Bois de Valmarie luxury camping site is perfectly situated. Le Bois de Valmarie luxury camping site is perfectly situated only 2 km from Argelès-sur-Mer harbour town. The surrounding coastline stretches for five miles and offers up a multi-choice of sandy beaches, towns and villages but you only have to go 0.02 km to find yourself directly on Plage Nord Argeles strand. This site is perched on a hilltop and overlooks the beautiful, Bay of Argelès, and has an impressive selection of bungalow tent and mobile home options on offer. Call LUX-camp today to find out more. Welcome to Le Bois de Valmarie Campsite. What's unique about Le Bois de Valmarie camping holiday? 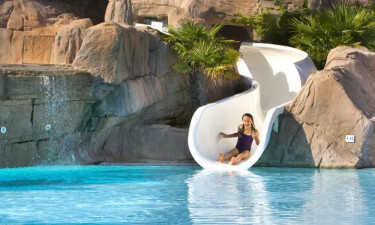 Great pool complex with six slides. Restaurant, cafeteria and take-away service. It might be hard to tear yourself away from your luxury mobile home at Le Bois de Valmarie but you don't have far to go to enjoy some real down time. The beach at Plage Nord Argeles is right beside the campsite and the perfect place for you and the family to hang out and relax. There's snorkelling and wind surfing activities to be had there, if you're not topping up your tan on the sandy stretch. Le Bois de Valmarie luxury camping offers the very best water frolics by way of a family friendly 2 pool extravaganza. 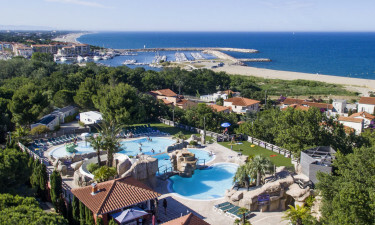 The lagoons are stylishly finished off with rocky surrounding and a choice of six slides so all members of the family can join in on the fun. There's a cordoned off section in one of the pools for little ones so you can supervise them from your sun lounger on the terrace. This campsite is near a lake and a river, which is perfect if you fancy some fresh water fishing. There are bikes to rent; a perfect way to explore the area. Argelès-sur-Mer itself, makes for a great family day out. Apart from a choice of quaint bistros, charming bars and restaurants that specialize in fish dishes in the harbour area, there is a museum, next to the medieval church that demonstrates how wine is made. This popular holiday resort has a lovely restaurant onsite; Val Marie. You can choose to dine indoors or under the stars on the terrace, making the most of the fantastic weather both day and night! There's a lively bar where you can sample some local wines as well as a cafeteria for a latte and a tasty take-away if you don't feel like cooking. The site has a mini market where you can stock up on your grocery essentials, but the harbour town of Argelès-sur-Mer, is filled with other shopping opportunities. The area is renowned for its excellent French cuisine; especially fish dishes. Make sure you pay a visit to one of the many restaurants and beautiful bistros dotted along the harbour.